The Avg. Group Discount is 6.6%! Our room was very clean and front desk staff friendly and helpful. Would stay here again. 06-Apr-2019 Verified Review, stayed from Mon Apr 01 to Wed Apr 03 2019 at a $119.20 average nightly rate. "Good hotel to visit New York." Good service, nice room, good room cleaning, good position with many subway lines around, good price. 10-Dec-2018 Verified Review, stayed from Sat Dec 01 to Fri Dec 07 2018 at a $165.00 group rate (5% discount). "Large high school group accommodations"
I am travel coordinator for a group of 47 Colorado high school students and their seven chaperones that traveled to New York City Oct. 24 27, 2018. We stayed at the Holiday Inn Brooklyn Downtown for three nights. Staff, prior to arrival, were very cooperative in helping us sort through room options and lodging costs. On arrival, front desk personnel had all room keys ready and organized. Rooms, although relatively small, were very clean, as was the hotel in general. Hotel staff made a conference room available to us (gratis) so that teachers could provide an area for students to eat a low cost, store bought breakfast each morning. The space also provided a place for teachers to talk to students about each day's activities. The hotel's location provides easy access to a variety of dining and shopping options (restaurants, grocery stores, Starbucks, etc. ), as well as several subway lines. Staff were friendly and cooperative, eager to help and very patient with the comings and goings of our large group. In general, an excellent experience. Strongly recommended. 28-Oct-2018 Verified Review, stayed from Wed Oct 24 to Sat Oct 27 2018 at a $277.00 group rate (5% discount). "Very Nice Hotel and Friendly Staff!" We stayed in this hotel for our team meeting; the meeting room is very nice, the service was great in everything. The hotel staff is very friendly and professional, the hotel is nicely decorated, modern style but warm and everything is kept very clean. The rooms are good too. The bar and restaurant are really cool and the food/drinks are excellent. The location is good, really downtown Brooklyn. Would recommend this hotel (and their staff) to everybody who is looking for a pleasant stay in NY. 26-Apr-2018 Verified Review, stayed from Tue Apr 24 to Thu Apr 26 2018 at a $204.00 group rate (10% discount). "Great Location and Room was Clean and Comfortable!" The location is perfect! Quick Uber everywhere and close to train stop. The elevators are probably the most inconvenient feature of this hotel. You will wait because the hotel service staff uses them and they stop on every single floor on the way up and down. The bar was very nice. The breakfast restaurant was not. Service was horrible. Food was okay, nothing to write home about. Coffee looked like Iced Tea. Venture out of the hotel for breakfast, that would be my recommendation. Nice quiet stay at night though. I would stay again. 19-Feb-2018 Verified Review, stayed from Fri Feb 16 to Sat Feb 17 2018 at a $121.00 group rate (10% discount). Thanks Jenn for your feedback!I'm sorry that you didn't enjoy the restaurant. We are actually currently renovating and bringing in a new team to assist. I do hope that you stay again in the future and give us another chance with our new chef. 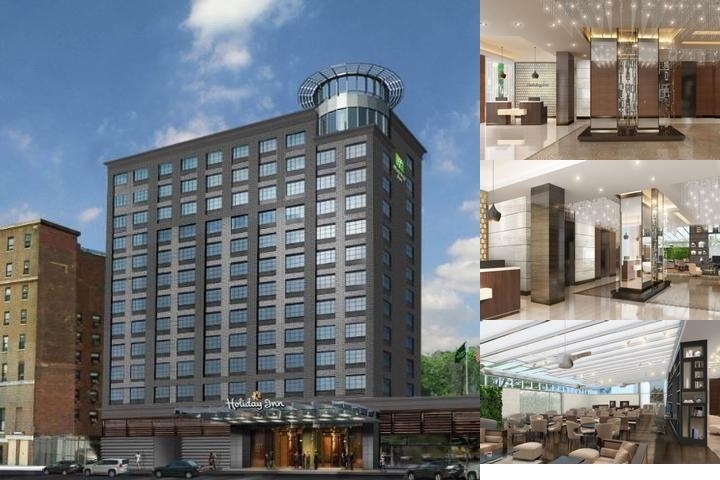 Holiday Inn Brooklyn Downtown is a brand new hotel located in the heart of downtown Brooklyn, minutes away from Downtown Manhattan. A perfect choice for guests travelling for business or pleasure, the hotel is sure to please. Enjoy premier shopping a short walk from the hotel at the all new City Point, opening in 2016. For those interested in world class entertainment, the Barclays Center, home to the Brooklyn Nets and New York Islanders, is a 10 minute walk away. Our close proximity to the Brooklyn Academy of Music, BAM, allows fine arts lovers the ability to enjoy any of their many performances. All of what Brooklyn has to offer, including other areas such as Williamsburg, Park Slope, and Brooklyn Heights are a short subway trip away. Guests can unwind in one of our 245 well-appointed guestrooms as well as enjoy some of the great hotel amenities such as sauna, indoor pool, and fitness center. Those looking to plan a small intimate social gathering or a corporate meeting, are in excellent hand with our full service catering department. Pets allowed with nonrefundable fee of $150.00 with maximum weight of 50 lbs. 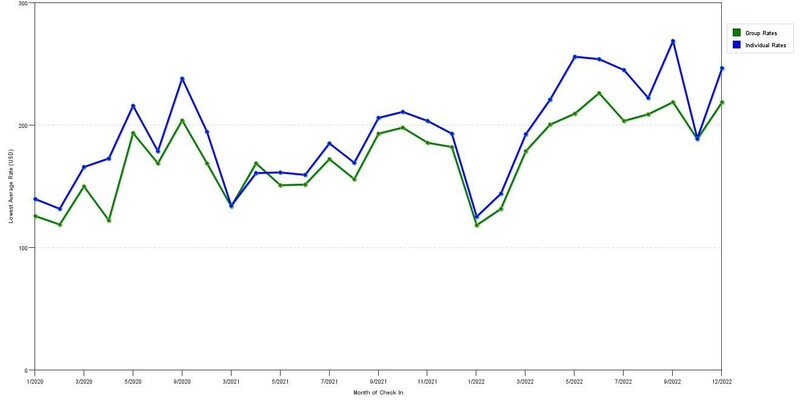 The graph above is seasonality of room rates for both our group prices and the lowest online individual rates our system could find at the time the group bid was submitted. The best group/meeting discount shown is 17.3% in March 2017 and the highest average individual rate is $259 in the month of September 2019. This chart will show past seasonality and also project future months. If you are flexible with dates, you may want to consider staying at Holiday Inn Brooklyn Downtown in a month when rates are lower. 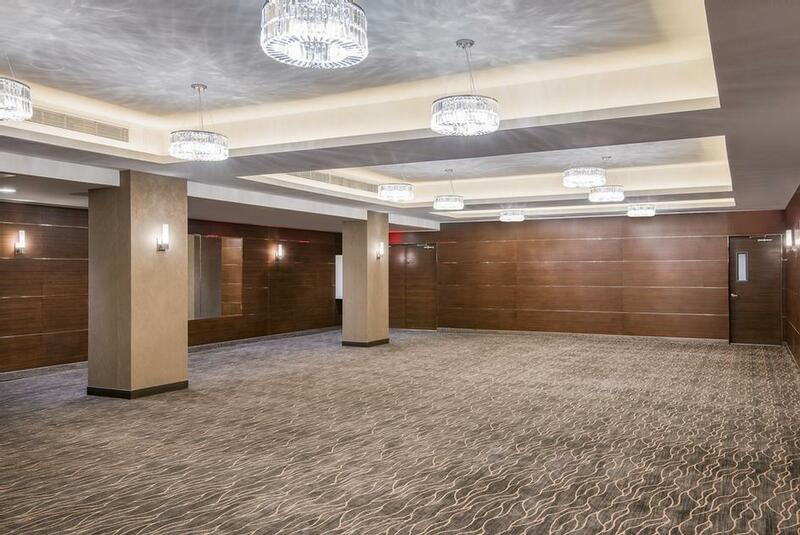 Below are the meeting, banquet, conference and event spaces at Holiday Inn Brooklyn Downtown. 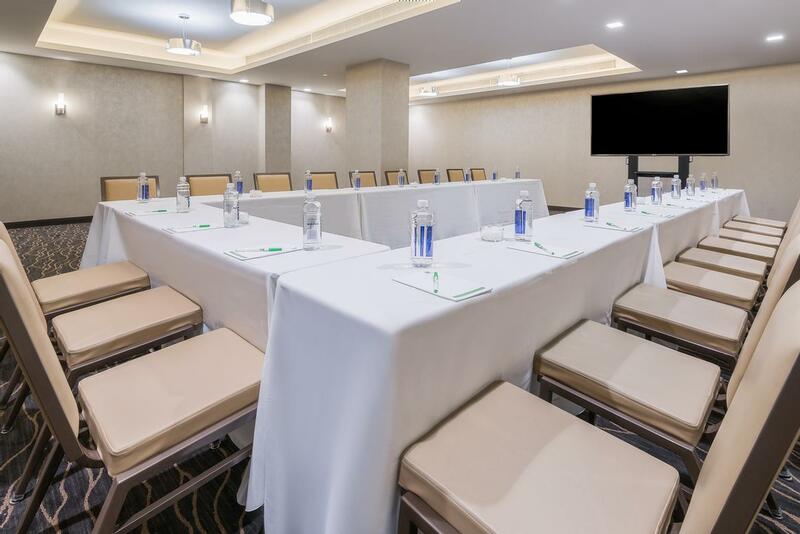 Feel free to use the Holiday Inn Brooklyn Downtown meeting space capacities chart below to help in your event planning. 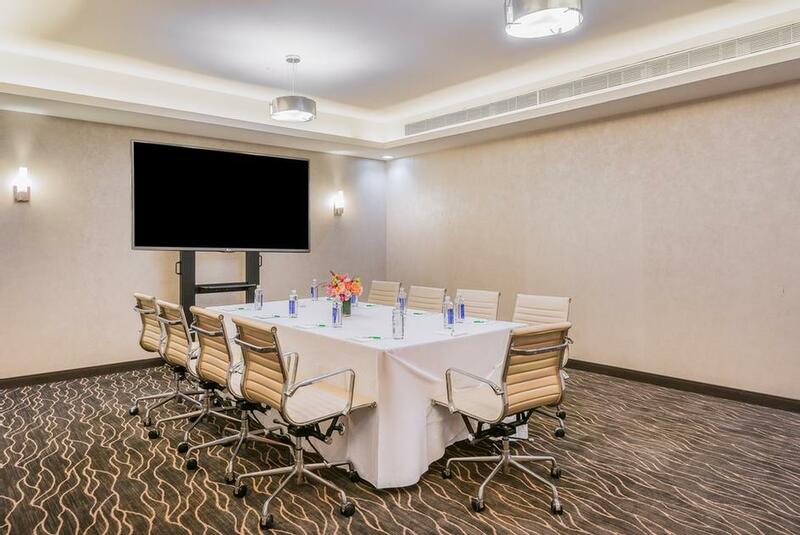 Hotel Planner specializes in Brooklyn event planning for sleeping rooms and meeting space for corporate events, weddings, parties, conventions, negotiated rates and trade shows. 2 x 2 x 12 Ft.
2 x 2 x 10 Ft.
29 x 26 x 8 Ft.